Wednesday after work I hopped on the N and headed downtown to Whitehall. Detail-oriented New York subway riders may take this time to point out: the N DOESN’T GO to WHITEHALL. 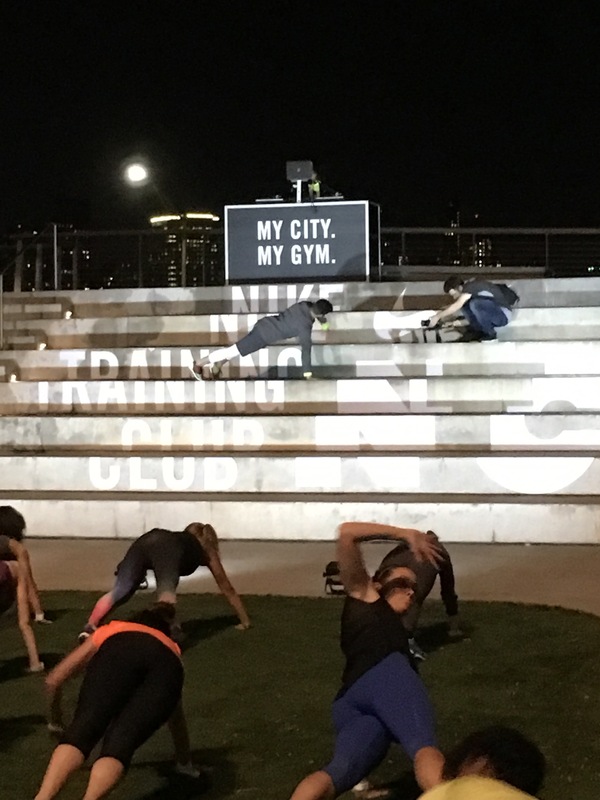 So yea, I got on the wrong train, detoured through Brooklyn and showed up a little bit late to the very awesome NTC x modelFIT collab at Elevated Acre. Elevated Acre is an acre-sized green space an escalator’s ride up from street level on Water Street in FiDi. I didn’t know this place existed (since the last time I was this far downtown is never). modelFIT is a boutique fitness studio on Bowery that’s been on my list to try for a long time. The NYT Fashion section covered modelFIT last year. 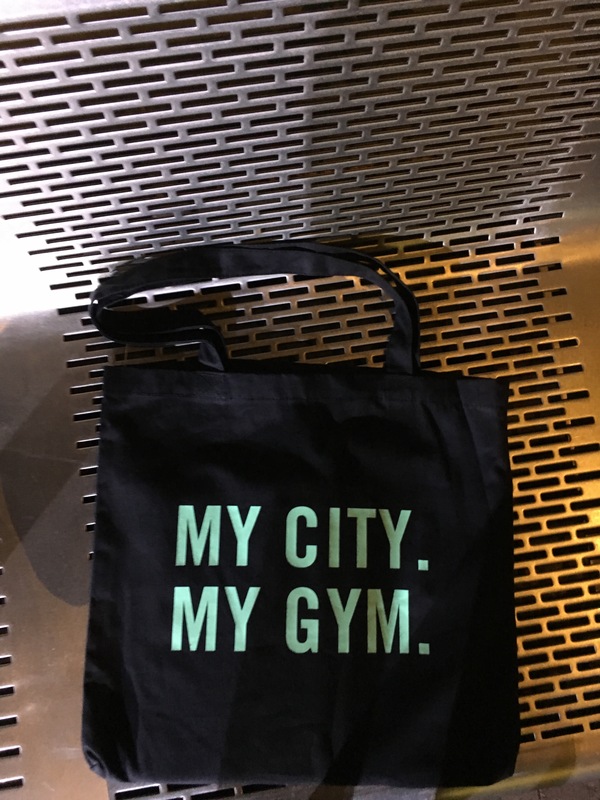 When I got to 55 Water Street I was greeted at the base of the escalator by a bouncer-type man in a suit accompanied by a neon-clad Nike rep. This was ideal because I had no idea if I was in the right place. At the top of the escalator two neon Nike ladies offered me a coat check, a place to change and the opportunity to test a pair of Nike Zoom Fit Agility 2s during the class (I declined instinctively because I wear orthotics but realized soon after I could’ve given it a go and should’ve). Elevated Acre has a turfed area with stadium style-seating on one side and incredible views of the city on another. 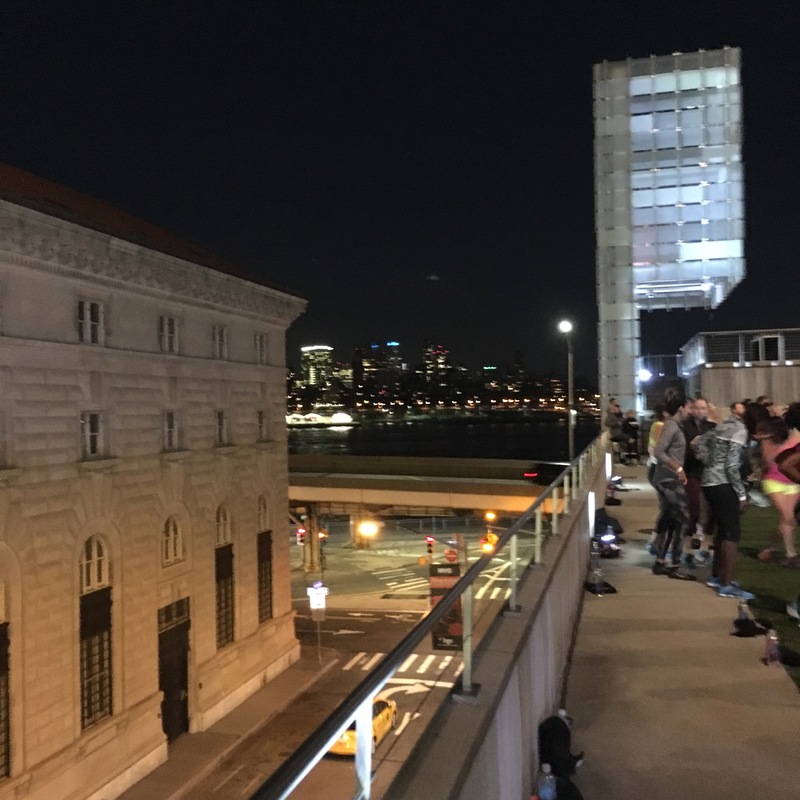 A live DJ was set up on the top of the stairs and about 100 people were gathered on the turf, ready to work out. The had an awesome light set up and a bunch of professional photographers roaming around. 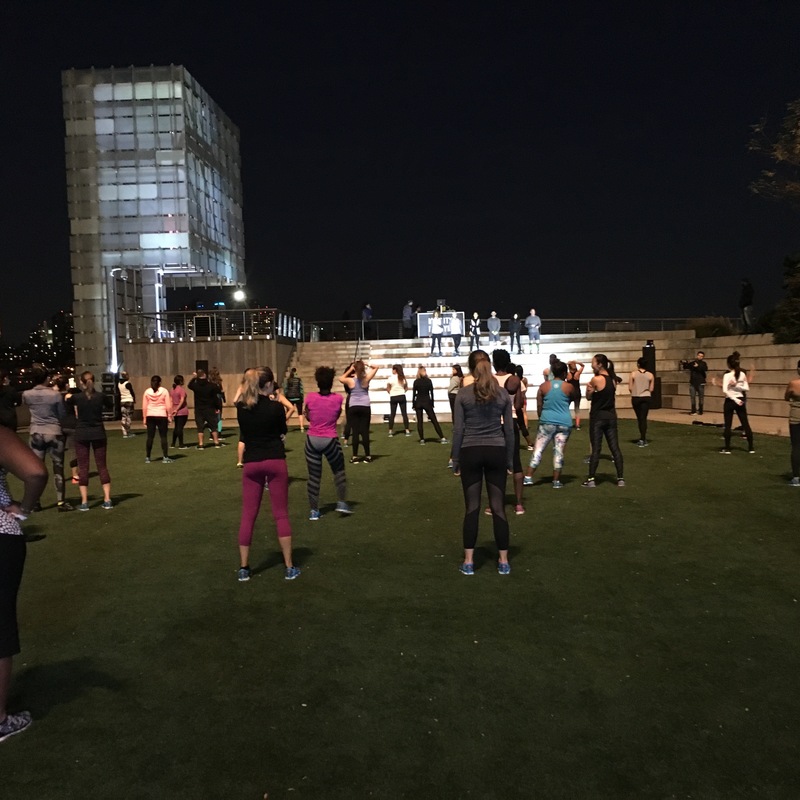 The first 30 minute workout was led by the Rebecca Kennedy – a Nike Training Club master trainer (she also teaches at Barry’s Bootcamp). We did a warm up, some short sprints followed by some body weight exercises. We partnered up for a game of slaps while planking. Basically, head to head in a plank, you lift up your hand and try to slap your partners hand, who has to move theirs before you can get to them. 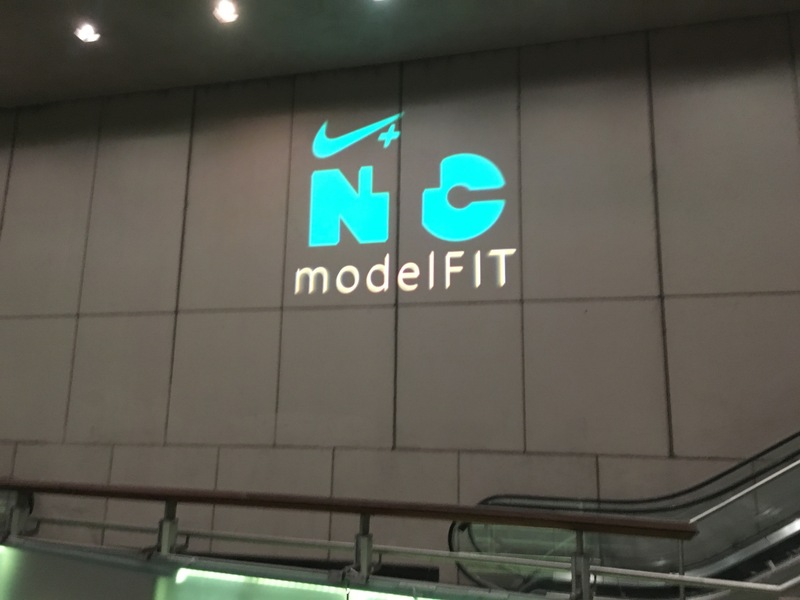 The second 30 minutes was led by modelFit. We stretched and did some seated thigh/glutes work on the floor. It was a much slower-paced workout then the first 30 minutes, but I liked it. At the end, they gave us branded totes and offered snacks care of Hu Kitchen (but I didn’t know where the snacks actually were, so I left, snackless, very unlike me). Overall it was a really professional event. It was well staffed and well designed. I’ve been to branded events before, but this was executed like serious business, not a community building effort. Also worth noting, 85% of the participants were actually wearing Nike gear. To the point where I wondered if I missed a memo. No one said anything to me, or made me feel uncomfortable in any way, but I didn’t realize Nike athletic gear was so widely owned. Maybe I should give their clothing another shot. Nike Training Club hosts free events EVERY. SINGLE. DAY. Did you know that? Now you do. They fill up so keep an eye on this page for sign ups. This is so cool! What a fun event. Yes! Nike does these events in a lot of cities. Worth checking out! !